The United Kingdom – United States of America Agreement (UKUSA, /juːkuːˈsɑː/ yoo-koo-SAH) is a multilateral agreement for cooperation in signals intelligence between Australia, Canada, New Zealand, the United Kingdom, and the United States. The alliance of intelligence operations is also known as the Five Eyes. In classification markings this is abbreviated as FVEY, with the individual countries being abbreviated as AUS, CAN, NZL, GBR, and USA, respectively. Emerging from an informal agreement related to the 1941 Atlantic Charter, the secret treaty was renewed with the passage of the 1943 BRUSA Agreement, before being officially enacted on 5 March 1946 by the United Kingdom and the United States. In the following years, it was extended to encompass Canada, Australia, and New Zealand. 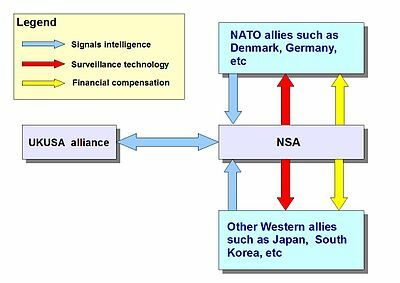 Other countries, known as "third parties", such as West Germany, the Philippines, and several Nordic countries also joined the UKUSA community in associate capacities, although they are not part of mechanism for automatic sharing of intelligence that exists between the Five Eyes. Much of the sharing of information is performed via the ultra-sensitive STONEGHOST network, which has been claimed to contain "some of the Western world's most closely guarded secrets". Besides laying down rules for intelligence sharing, the agreement formalized and cemented the "Special Relationship" between the UK and the US. Due to its status as a secret treaty, its existence was not known to the Prime Minister of Australia until 1973, and it was not disclosed to the public until 2005. On 25 June 2010, for the first time in history, the full text of the agreement was publicly released by the United Kingdom and the United States, and can now be viewed online. Shortly after its release, the seven-page UKUSA Agreement was recognized by Time magazine as one of the Cold War's most important documents, with immense historical significance. The global surveillance disclosure by Edward Snowden has shown that the intelligence-sharing activities between the First World allies of the Cold War are rapidly shifting into the digital realm of the Internet. 3.2 9 Eyes, 14 Eyes, and other "third parties"
Acquisition of communications documents and equipment. Acquisition of information regarding communications organizations, procedures, practices and equipment. The agreement originated from a ten-page 1943 British–U.S. Communication Intelligence Agreement, BRUSA, that connected the signal intercept networks of the U.K. Government Communications Headquarters (GCHQ) and the U.S. National Security Agency (NSA) at the beginning of the Cold War. The document was signed on 5 March 1946 by Colonel Patrick Marr-Johnson for the U.K.'s London Signals Intelligence Board and Lieutenant General Hoyt Vandenberg for the U.S. State–Army–Navy Communication Intelligence Board. Although the original agreement states that the exchange would not be "prejudicial to national interests", the United States often blocked information sharing from Commonwealth countries. The full text of the agreement was released to the public on 25 June 2010. The "Five Eyes" term has its origins as a shorthand for a "AUS/CAN/NZ/UK/US EYES ONLY" classification level. Under the agreement, the GCHQ and the NSA shared intelligence on the Soviet Union, the People's Republic of China, and several eastern European countries (known as Exotics). The network was expanded in the 1960s into the Echelon collection and analysis network. The treaty was extended to include Canada (1948), Australia (1956) and New Zealand (1956). In 1955, the agreement was updated to designate Canada, Australia and New Zealand as "UKUSA-collaborating Commonwealth countries". Other countries that joined as "third parties" were Norway (1952), Denmark (1954) and West Germany (1955). In the aftermath of the 1973 Murphy raids on the headquarters of the Australian Security Intelligence Organisation (ASIO), the existence of the UKUSA Agreement was revealed to Australia's Prime Minister Gough Whitlam. After learning about the agreement, Whitlam discovered that Pine Gap, a secret surveillance station close to Alice Springs, Australia, had been operated by the U.S. Central Intelligence Agency (CIA). At the height of the 1975 Australian constitutional crisis, the use and control of Pine Gap by the CIA was strongly opposed by Whitlam, who fired the chief of the ASIO before being dismissed as prime minister. In Canada, an investigative television report revealed the existence of the Communications Security Establishment Canada (CSEC). In the United States, the Church Committee of the Senate revealed the existence of the National Security Agency (NSA). In Britain, an investigative article in Time Out magazine revealed the existence of the Government Communications Headquarters (GCHQ). In Australia, the Hope Commission revealed the existence of Australian Secret Intelligence Service (ASIS) and the Defence Signals Directorate (DSD). In New Zealand, the existence of the Government Communications Security Bureau (GCSB) was officially disclosed on a "limited basis". In 1999, the Australian government acknowledged that it "does co-operate with counterpart signals intelligence organisations overseas under the UKUSA relationship." The existence of the UKUSA Agreement, however, was not publicly revealed until 2005. The contents of the agreement were officially disclosed to the public on 25 June 2010. Four days later, the agreement was described by Time magazine as one of the "most important documents in the history of the Cold War." In July 2013, as part of the 2013 Edward Snowden revelations, it emerged that the NSA is paying GCHQ for its services, with at least £100 million of payments made between 2010 and 2013. On 11 September 2013, The Guardian released a leaked document provided by Edward Snowden which reveals a similar agreement between the NSA and Israel's Unit 8200. According to The Sydney Morning Herald, Australia operates clandestine surveillance facilities at its embassies "without the knowledge of most Australian diplomats". These facilities are part of an international espionage program known as STATEROOM. Although precise assignments are classified, it is generally known that each member of the UKUSA alliance takes lead responsibility for intelligence collection and analysis in different parts of the globe. The "Five Eyes", often abbreviated as "FVEY", refer to an intelligence alliance comprising Australia, Canada, New Zealand, the United Kingdom and the United States. These countries are bound by the multilateral UKUSA Agreement, a treaty for joint cooperation in signals intelligence. Canada's geographical proximity to the Soviet Union provided considerable eavesdropping advantages during the Cold War. Canada continues to monitor the Russian and Chinese interior while managing intelligence assets in Latin America. In addition to Southeast Asia, New Zealand is responsible for the western Pacific and maintains listening posts in the South Island at Waihopai Valley just south-west of Blenheim, and on the North Island at Tangimoana. The U.S. is focused on the Middle East, China, and Russia, in addition to the Caribbean and Africa. 9 Eyes, 14 Eyes, and other "third parties"
The "Five Eyes" community is part of an extensive alliance of Western countries sharing signals intelligence with each other. These allied countries include NATO members, other European countries such as Sweden, and allies in the Pacific, in particular Singapore and South Korea. In the 1950s several Nordic countries joined the community as "third party" participants. They were soon followed by Denmark (1954) and West Germany (1955). According to Edward Snowden, the NSA has a "massive body" called the Foreign Affairs Directorate that is responsible for partnering with other Western allies such as Israel. Unlike the "second party" members (that is, the Five Eyes themselves), "third party" partners are not automatically exempt from intelligence targeting. According to an internal NSA document leaked by Snowden, "We (the NSA) can, and often do, target the signals of most 3rd party foreign partners." The "Nine Eyes", consisting of the Five Eyes plus Denmark, France, the Netherlands, and Norway. The "Fourteen Eyes", consisting of the same countries as the Nine Eyes plus Germany, Belgium, Italy, Spain, and Sweden. The actual name of this group is SIGINT Seniors Europe (SSEUR) and its purpose is coordinating the exchange of military signals intelligence among its members. Germany is reportedly interested in moving closer to the inner circle: an internal GCHQ document from 2009 said that the "Germans were a little grumpy at not being invited to join the 9-Eyes group." Germany may even wish to join Five Eyes. Referring to Five Eyes, French President François Hollande has said that his country is "not within that framework and we don't intend to join." According to a former top U.S. official, "Germany joining would be a possibility, but not France – France itself spies on the US far too aggressively for that." During the 2013 NSA leaks Internet spying scandal, the surveillance agencies of the "Five Eyes" have been accused of intentionally spying on one another's citizens and willingly sharing the collected information with each other, allegedly circumventing laws preventing each agency from spying on its own citizens. The 2013 NSA leaks are not entirely new, but rather, they are a confirmation of earlier disclosures about the UK-US espionage alliance. For example, the British newspaper The Independent reported back in 1996 that the U.S. National Security Agency "taps UK phones" at the request of the British intelligence agency MI5, thus allowing British agents to evade restrictive limitations on domestic telephone tapping. Britain's GCHQ intelligence agency can spy on anyone but British nationals, the NSA can conduct surveillance on anyone but Americans, and Germany's BND (Bundesnachrichtendienst) foreign intelligence agency can spy on anyone but Germans. That's how a matrix is created of boundless surveillance in which each partner aids in a division of roles. They exchanged information. And they worked together extensively. That applies to the British and the Americans, but also to the BND, which assists the NSA in its Internet surveillance. It does not matter how senior you are, and how close a friend you think you are to Washington or London, your communications could easily be being shared among the handful of white, English-speaking nations with membership privileges. In 2013, Canadian federal judge Richard Mosley strongly rebuked the Canadian Security Intelligence Service (CSIS) for outsourcing its surveillance of Canadians to overseas partner agencies. A 51-page ruling says that the CSIS and other Canadian federal agencies are illegally enlisting U.S. and British allies in global surveillance dragnets, while keeping domestic federal courts in the dark. NSA document reveals the German BND's usage of the NSA's XKeyscore to provide "unique contributions"
^ "Declassified UKUSA Signals Intelligence Agreement Documents Available" (Press release). National Security Agency. 24 June 2010. Retrieved 25 June 2010. ^ a b c d e f g h i j Cox, James (December 2012). "Canada and the Five Eyes Intelligence Community" (PDF). Canadian Defence and Foreign Affairs Institute. Archived from the original (PDF) on 5 February 2014. ^ Paul Farrell (2 December 2013). "History of 5-Eyes – explainer". The Guardian. Retrieved 28 December 2013. ^ McGregor, Richard. "Global Insight: US spying risks clouding 'five eyes' vision". Financial Times. Retrieved 30 August 2013. ^ Ben Grubb. "Mission almost impossible: keeping a step ahead of prying 'Five Eyes'". The Sydney Morning Herald. Retrieved 21 October 2013. ^ Gurney, Matt. "Canada Navy Spy Case". National Post. Archived from the original on 13 August 2013. Retrieved 13 August 2013. ^ a b c d Norton-Taylor, Richard (25 June 2010). "Not so secret: deal at the heart of UK-US intelligence". The Guardian. Retrieved 25 June 2010. ^ a b c Gallagher, Ryan (19 June 2014). "How Secret Partners Expand NSA's Surveillance Dragnet". The Intercept. Retrieved 27 September 2014. ^ Rob Gordon. "Navy spy probe kept military in dark: documents". Canadian Broadcasting Corporation. Retrieved 20 October 2013. The military's fears were well-founded, given Delisle had access to terabytes of some of the Western world's most closely guarded secrets. He operated a computer system called Stone Ghost, which links the intelligence services of the Five Eyes: the United States, Britain, Canada, Australia and New Zealand. ^ Duncan Gardham (24 June 2010). "Document that formalised 'special relationship' with the US". The Daily Telegraph. Retrieved 29 October 2013. ^ a b c d e Adam White (29 June 2010). "How a Secret Spy Pact Helped Win the Cold War". Time. ^ Jordan Chittley & Kevin Newman. "Canada's role in secret intelligence alliance Five Eyes". CTV News. Retrieved 20 October 2013. ^ "Newly released GCHQ files: UKUSA Agreement". The National Archives. June 2010. The files contain details of the recently avowed UKUSA Agreement – the top secret, post-war arrangement for sharing intelligence between the United States and the UK. Signed by representatives of the London Signals Intelligence Board and its American counterpart in March 1946, the UKUSA Agreement is without parallel in the Western intelligence world and formed the basis for co-operation between the two countries throughout the Cold War. ^ MELISSA EDDY (9 July 2013). "For Western Allies, a Long History of Swapping Intelligence". The New York Times. Retrieved 20 October 2013. ^ Nathan Smith. "The world of signals intelligence and GCSB in context". National Business Review. Retrieved 20 October 2013. A partnership with various telecommunications industries has secured access to the internet for the UKUSA signals agencies. All traffic on the internet and via emails is reportedly captured and stored. ^ Alexander Abdo & Patrick Toomey. "The NSA is turning the internet into a total surveillance system". The Guardian. Retrieved 20 October 2013. ^ Gardham, Duncan (24 June 2010). "Document that formalised 'special relationship' with the US". The Daily Telegraph. Retrieved 25 June 2010. ^ Norton-Taylor, Richard (25 June 2010). "Not so secret: deal at the heart of UK-US intelligence". The Guardian. Retrieved 27 January 2014. ^ Ley, Jenny (1 February 2003). "Australia and America: a 50-year affair". The Age. Retrieved 30 January 2014. ^ Gill, Peter (1994). Policing Politics: Security Intelligence and the Liberal Democratic State (1. publ. ed.). London u.a. : Cass. p. 198. ISBN 0-7146-3490-5. ^ Pugh, Michael C. (1989). The ANZUS Crisis, Nuclear Visiting and Deterrence (1. publ. ed.). Cambridge: Cambridge University Press. p. 46. ISBN 0-521-34355-0. ^ Campbell, Duncan (28 May 1999). "Australia first to admit "we're part of global surveillance system"". Heise Online. Retrieved 30 January 2014. ^ Freeze, Colin (30 November 2013). "How CSEC became an electronic spying giant". The Globe and Mail. Retrieved 2 February 2014. ^ Schorr, Daniel (29 January 2006). "A Brief History of the NSA". NPR. Retrieved 2 February 2014. ^ Ewen MacAskill, Julian Borger & Glenn Greenwald (6 June 2013). "The National Security Agency: surveillance giant with eyes on America". The Guardian. Retrieved 2 February 2014. ^ Norton-Taylor, Richard (21 August 2013). "Surveillance secrecy: the legacy of GCHQ's years under cover". The Guardian. Retrieved 30 November 2013. GCHQ's cover was first blown in 1976 by an article, The Eavesdroppers, published by the London magazine, Time Out. ^ "Royal Commission on Intelligence and Security". National Archives of Australia. Retrieved 2 February 2014. But Justice Hope also investigated the Joint Intelligence Organisation (JIO), the Defence Signals Division (DSD) and the Australian Secret Intelligence Service (ASIS) whose existence was not officially confirmed until 1977. ^ "History of the GCSB". Government Communications Security Bureau. Archived from the original on 17 August 2013. Retrieved 2 February 2014. In 1977, the then Prime Minister, Robert Muldoon, approved the formation of the GCSB, but its functions and activities were kept secret. In 1980 it was decided that the existence of the GCSB could be disclosed on a limited basis, leading to the first briefings of the Cabinet and the Leader of the Opposition. ^ Duncan Campbell & Mark Honigsbaum (23 May 1999). "Britain and US spy on world". The Observer. Retrieved 19 December 2013. ^ "NZ role with global spying alliance". The New Zealand Herald. 30 June 2000. Retrieved 30 January 2014. ^ NSA pays £100m in secret funding for GCHQ, The Guardian, 1 August 2013. Retrieved 2 Aug 2013. ^ Glenn Greenwald, Laura Poitras & Ewen MacAskill. "NSA shares raw intelligence including Americans' data with Israel | World news". The Guardian. Retrieved 9 July 2014. ^ Philip Dorling (31 October 2013). "Exposed: Australia's Asia spy network". The Sydney Morning Herald. Retrieved 22 December 2013. ^ "Five Eyes". United States Army Combined Arms Center. Archived from the original on 18 January 2014. Retrieved 18 January 2014. ^ "PKI Interoperability with FVEY Partner Nations on the NIPRNet". United States Department of the Navy. Archived from the original on 18 January 2014. Retrieved 18 January 2014. ^ a b "They're Listening To Your Calls". Bloomberg Businessweek. 30 May 1999. ^ Duncan Campbell (25 July 2000). "Inside Echelon". Heinz Heise. Retrieved 20 October 2013. The system was established under a secret 1947 "UKUSA Agreement," which brought together the British and American systems, personnel and stations. To this was soon joined the networks of three British commonwealth countries, Canada, Australia and New Zealand. Later, other countries including Norway, Denmark, Germany and Turkey signed secret sigint agreements with the United States and became "third parties" participants in the UKUSA network. ^ Laura Poitras, Marcel Rosenbach & Holger Stark. "Ally and Target: US Intelligence Watches Germany Closely". Der Spiegel. Retrieved 29 August 2013. The NSA classifies about 30 other countries as "3rd parties," with whom it cooperates, though with reservations. Germany is one of them. "We can, and often do, target the signals of most 3rd party foreign partners," the secret NSA document reads. ^ "Denmark is one of the NSA's '9-Eyes'" (in Danish). The Copenhagen Post. 4 November 2013. Retrieved 10 April 2016. ^ GCHQ taps fibre-optic cables for secret access to world's communications, The Guardian, 21 June 2013. Retrieved July 2013. ^ NSA 'offers intelligence to British counterparts to skirt UK law', The Guardian, 10 June 2013. Retrieved July 2013. ^ GCHQ-NSA revelations – Hague responds: politics blog, The Guardian, 10 June 2013, Retrieved July 2013. ^ British spy agency taps cables, shares with U.S. NSA – Guardian, Reuters, 21 June 2013. Retrieved July 2013. ^ Chris Blackhurst & John Gilbert (22 September 1996). "US spy base 'taps UK phones for MI5'". The Independent. ^ Julian Borger. "Merkel spying claim: with allies like these, who needs enemies?". The Guardian. Retrieved 23 October 2013. ^ Colin Freeze (20 December 2013). "Canada's spy agencies chastised for duping courts". The Globe and Mail. Retrieved 27 December 2013. ^ Ian MacLeod (20 December 2013). "CSIS asked foreign agencies to spy on Canadians, kept court in dark, judge says". Ottawa Citizen. Archived from the original on 22 December 2013. Retrieved 27 December 2013. ^ Stewart Bell (25 November 2013). "Court rebukes CSIS for secretly asking international allies to spy on Canadian terror suspects travelling abroad". National Post. Retrieved 27 December 2013. Bryden, John. Best Kept Secret: Canadian Secret Intelligence in the Second World War. Toronto: Lester Publishing, 1993, ISBN 1895555299. Frost, Mike and Michel Gratton. Spyworld: Inside the Canadian and American Intelligence Establishments. Toronto: Doubleday Canada, 1994. Rosen, Philip. The Communications Security Establishment: Canada's Most Secret Intelligence Agency. Ottawa: Library of Parliament Research Branch, 1993. Rudner, Martin. "Canada's Communications Security Establishment: From the Cold War to Globalization", Intelligence and National Security. Volume 16 Number 1 (Spring 2001). 97–128. Whitaker, Reginald. "Cold War Alchemy: How America, Britain, and Canada Transformed Espionage into Subversion", Intelligence and National Security. Kurt Opsahl, Electronic Frontier Foundation: It Always Feels Like the Five Eyes Are Watching You, 35C3, 2018-28-12.